The heat in high temperature areas is over 200°C, especially in the top 1000 meters of the earth's crust. Most of the high temperature areas are located inside the volcanic zone and are connected to the volcanoes, usually inside active volcanoes. The high temperature areas in Iceland are about 30 and the total square area of these areas are about or over 400 square kilometers. Torfajökull east of Hekla, Grímsvötn in the Vatnajökull glacier, Hengill near Reykjavík, Kerlingarfjöll, Námafjall near Mývatn, Kverkfjöll on the north side of Vatnajökull and Krísuvík south of Reykjavík are the main high-temperature areas. Two high temperature areas, Hveragerðissvæði and Geysissvæði, are hardly counted inside the volcanic zone. Both of these high temperature areas are in the active zone of volcanos which haven´t erupted since the previous glacial period. In high temperature areas are mostly mud pots, sulphur pots and fumaroles. In Hveragerðissvæði and Geysisvæði are also hot springs and low phreatic position is the cause of that. In the geothermal heat water in the high temperature areas are more of dissolved chemicals than in the water in the low temperature areas. Water from high temperature areas is usually rather sour and therefore difficult to use directly. High temperature areas are mostly used for heat exchange. Hot water or steam is used to heat up cold water. The plant work in Svartsengi, for example, uses steam to heat cold water. “The Blue Lagoon” is nothing else than a run-off water from the power plant, which has been used to heat cold water. In Iceland you can find low-temperature fields in older bedrocks, where the younger rifts are. All of them are situated outside the active volcanic zone. The heat of the water in the low-temperature fields is changeable, from over 100°C, down to a few degrees. The temperature at the top 1000 meters under the surface is below 150°C. The surface of low-temperature fields is mostly covered with hot springs and geysers. The hot water of these areas is mostly alkaline. The chemical contents of low-temperature water is most of the times like the chemical contents of freshwater, and because of that, it's possible to use the low-temperature water for use. The water magnitude on singular low-temperature fields is very different. Flows from exclusive hot springs can be from less than half a liter per second, up to 180 liters per second. The geyser with the most water in it in Iceland, is “Deildartunguhver in Borgarfjörður”, with about 180 liters of water per second. The transformation of rocks in low-temperature fields is mostly small, though silicon often falls out and develops sinter. Low-temperature areas with hot springs are found all over Iceland. There are about 250 geothermal areas of this type with a total of about 800 hot springs. In low-temperature fields are water holes and the warmest water holes are called hot springs. They are 75-100°C. Some of the hot springs spouts are then called geysers, but they are most in the high temperature geothermal area. Water holes which are 20-75°C are called pools, but 5-20°C holes are called lukewarm pools. Colder holes are called spring fed rivers. Each geyser is said to have its own unique “plumbing” system. The power in that plumbing system and the heat in the earth, is the reason for them to erupt. When water and gas erupt from a geyser it is due to the hot and cool fluid sources interacting with each other. Every geyser field in the world is located near some sort of volcanic, shallow lying or heat source. There seems to be four common reservoir types of geysers. The first one, a single standpipe that is connected to an underground reservoir with a raised cone at surface. The second has deep, rather narrow shafts. The third has standpipes much like those in the first type, but cones do not form around their surface openings. Yet their openings have slightly raised rims and are in pools of water. The last have deep reservoirs and depending on the connection, thickness, etc., the eruption will vary. Geysir is probably the most famous geyser in the world. 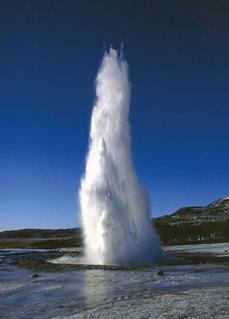 The English word "geyser" is derived from the Icelandic word "geysir" which means gusher. When Geysir was active it could sprout water and steam up to 80 meters high. Today Geysirs brother Strokkur is one of the most active geysers in Iceland. When the hot water comes up under the surface of high temperature areas, it often starts boiling. When it boils, many types of gas get mixed together, carbon dioxide, hydrogen sulphide and hydrogen, with the surface water, and the water gets acid. The sour water doesn't, as a rule, go down to more than a few meters deep. Therefore, the water is even more alkaline under the meteoric water stretch. When the hydrogen sulphide (H2S) blends with the oxygen of the air, a sulfuric acid (H2SO4) is generated, and it macerates the rock. The acid water often causes a lot of transformation and chanings the rock around the geysers, and makes along with the precipitation, the great colourfulness, which is a characteristic for the high temperature areas. The yellow color is because of the sulfating. The red, brown and green colours are because of iron oxide, white colours are because of calcium and silicon, and gray colour is because of pyrite and clay. When hot water gets cold, it can't carry as much of dissolved chemicals as before. Then, the chemicals fall out and sink to the bottom or settle on to the walls. Then it is called cold precipitation. This is always happening in the nature in the high temperature areas.